Phosphorus is the biggest cause of water quality degradation worldwide, causing ‘dead zones’, toxic algal blooms, a loss of biodiversity and increased health risks for the plants, animals and humans that come in contact with polluted waters. This threatens the loss of economic and social benefits from freshwaters upon which society relies. In a series of studies published in a special issue of Water Research, leading scientists assess how geo-engineering in lakes can control phosphorus pollution. 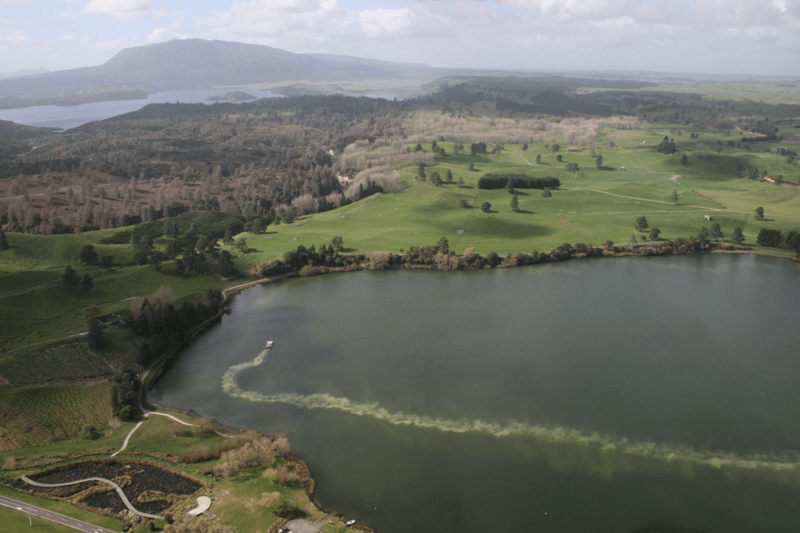 After decades of run-off from agriculture, human sewage and industrial practices, phosphorus has been stock piled at an alarming rate in our lake bed sediments. The scale of the problem is daunting, and humans are still pumping about 10 million tonnes of extra phosphorus into our freshwaters every year. Long-term monitoring activities following the control of phosphorus sources to lakes show that plants and animals don’t recover for many years. This is because phosphorus stored in bed sediments is released back to the water column. Society then has to make a decision – either speed up recovery using geo-engineering to cap sediment phosphorus stores, or do nothing, and accept poor quality freshwaters for decades to come. Geo-engineering is contentious, costly, and the side effects are not well known. This special issue brings together 60 authors from 12 countries to present evidence on this approach. The special issue was led by the University of Wageningen (The Netherlands), The Centre for Ecology & Hydrology (UK), and the University of Southern Denmark (Denmark). Read more about geo-engineering in lakes and watch the authors present their work. “Editorial – A critical perspective on geo-engineering for eutrophication management in lakes,” by M. Lurling, E. Mackay, K. Reitzel, B.M. Spears (doi: 10.1016/j.watres.2016.03.035). It appears in Water Research, volume 97C (2016), published by Elsevier. “A meta-analysis of water quality and aquatic macrophyte responses in 18 lakes treated with lanthanum modified bentonite (Phoslock®)”, by B.M. Spears, E.B. Mackay, S. Yasseri, I.D.M. Gunn, K.E. Waters, C. Andrews, S. Cole, M. De Ville, A. Kelly, S. Meis, A.L. Moore, G.K. Nürnberg, F. van Oosterhout, J.A. Pitt, G. Madgwick, H.J. Woods, M. Lürling, (doi: 10.1016/j.watres.2015.08.020). It appears in Water Research, volume 97C (2016), published by Elsevier. “Longevity and effectiveness of aluminum addition to reduce sediment phosphorus release and restore water quality,” by B.J. Huser, S. Egemose, H. Harper, M. Hupfer, H. Jensen, K.M. Pilgrim, K. Reitzel, E. Rydin, M.N. Futter (doi: 10.1016/j.watres.2015.06.051). It appears in Water Research, volume 97C, published by Elsevier. Water Research is a joint publication of Elsevier and the International Water Association (IWA). It is the top scientific journal in the field of science and technology of water quality, water technology and water management worldwide.